The question was asked of me this morning if I am getting beer'd out. I think I likely would be if all of the beer were the same. Luckily with 24 different styles from 17 countries, I think I’m going to be excited 'til the very end... and then sad. Today’s beer comes to us from Brazil. This is our first South American beer of the calendar. The beer comes to from the Wäls brewery located in Belo Horizante, the capital of the Minas Gerais state in Brazil. Founded in 1999 the brewery wanted to bring beer to the demanding consumer. They chose the tourist region of Belo Horizante as the location for their dream and started brewing beers based off the Belgian, Czech and English styles. Dare, invent and believe is the spirit by with the brewery creates its beers. The brewery itself produces a number of different styles of beers and employs some different methods such as oak barrel maturation and brewing in the champenoise style (sparkling wine/champagne method). They have enough storage for 2500 bottles to mature at any given time. 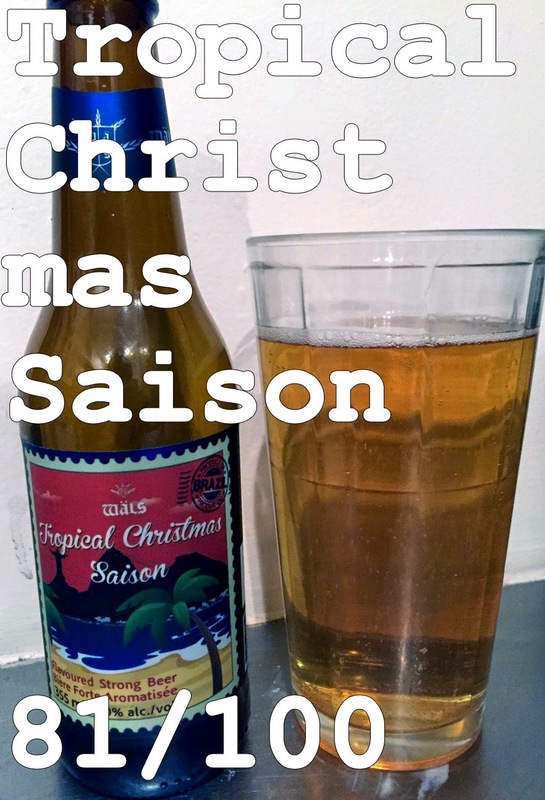 They like to produce unique beers from the standard Pilsner, to Hoppy Vanilla Cookie, and the one we are trying today which is their Tropical Christmas Saison, a flavoured strong beer sitting at 7% alcohol/volume. Saison (French for season) is a broadly defined pale ale that is generally around the 7% mark for alcohol, highly carbonated, fruity and spiced. This particular one has had raisins, figs, orange peel and coriander added to it during the brewing process to create the “Tropical Christmas.” This style of beer originated from beers brewed during cooler less active months in Wallonia, the French-speaking region of Belgium, and it is thus a Belgian style beer similar in many ways to the Krampus that I tried a little while back. Let’s give this one a try! Appearance: Clear, golden, and light bodied with minimal head that retains well. Smell: Figs are noticeable right on the nose with the coriander and citrus from the orange close behind. Taste: Very light and crisp on the front with citrus and the flavour of the figs and the coriander coming through at the end to create a dryness that results in a refreshingly dry beer. The coriander leaves your mouth dry and works well with the sweetness to create a fairly well balanced beer. It would make a fantastic summer beer which makes sense as Christmas is during the Brazilian Summer, go figure. Mouth feel: High carbonation, light bodied, crisp. Overall: Refreshing, light, citrusy with not too much spice or fruit flavouring to overwhelm the taste buds. This is an excellent saison in that it really fits what it is trying to accomplish. The flavours are truly Christmassy and given that it is summer time south of the equator, the refreshing crispness of the beer works well. Do I like it: Considering that I was expecting the Krampus, which I did not like, I was pleasantly surprised with this beer. It was delicious. While it is not my favorite style of beer I found myself enjoying the flavours and the crispness of this particular saison. I dare say, I would drink it again!